And for those looking for some help in doing actual work in the classroom there is this site, ArtsEdNet now underwritten by the Getty, which I used many times when I was doing weekly lessons. This entry was posted in offtopic on March 18, 2007 by shiborigirl. As I create my personal course of study on shibori, textiles, craft etc., I mix actual practice of shibori with the desire to understand the market for crafts and the significance of craft in today’s world. As often is the case, I turn to Karren Brito’s blog for a lesson and discovered the term “communities of practice”. For an indepth explaination of this, you can listen to Dennis Stevens’ talk for which she provides a link. Personally, I find this a fascinating topic. I want to hear the thoughts of other artists/makers on this subject. By posting comments on this and other related topics, I am able to sort out my thoughts and add my perspective to the conversation. In other business, the flickr photo pool is growing and it’s fun to see what others are doing and what their interests are. so different from the one’s I’m receiving-at least so far. What I would love to do is a postcard swap limited to using shibori fabics. Hmmm……any takers? Above image is of the last card I sent out. It reminded me of a spider and I used a silver metalic thread to machine quilt it with. I wanted the thread to mimic a web and I liked the way the stitching around the edge looked like fine wire(can’t see it in this photo). Also added a piece of the arashi shibori ribbon I made last week. Oh- and here is the start of the quilt block I was playing with before. 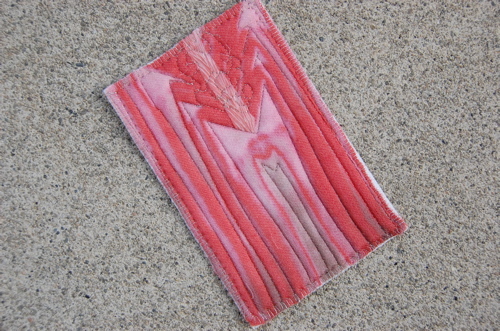 This entry was posted in arashi shibori, offtopic, quilting, shibori on January 14, 2007 by shiborigirl. Today I’ll write a rather meandering offtopic post for your entertainment (or mostly my own) as I am taking a bit of a break from my work to let my newly surgicized shoulder recover from a bit of repair work. Too many years of production ceramic studio work! A few weeks of physical therapy and I’ll be ready to get back to the practice of shibori. Again, Karren Brito is having an interesting discussion on the state of fine crafts in our world today. It’s worth reading and it would be great to hear comments from others who make their living as artists, makers , and craftspeople. Recently, a friend sent me this article entitled “Twilight for the Kimono” from the Washington Post which talks about the diminishing ranks of master weavers and kimono makers in Japan. Traditional crafts as a means of support are disappearing around the world and even in Japan which is renowned for its Living National Treasures , the issue of making a living as a fine crafts person is in question. As we become a global economy, the world’s workroom shifts from one up and coming third world country to another as the search for a lower price combined with quality product continues. But at what cost? Some of these countries sacrifice the environment, workers health, and education to compete for contracts. Eventually, wages, working conditions and environmental standards rise, costs increase and perhaps the contracts shift to places where prices don’t reflect these costs. There are benefits as well- lower prices for these items and increased standard of living for the producers to name a couple. The question of who should be educating people about arts and crafts, is difficult to answer. Of course I’d like to think that our public schools would provide a basic level of arts education but it just isn’t so. I spent many years volunteering as an art teacher at the local elementary school when I discovered my kids were not getting art class. I taught drawing, sculpture, spinning, weaving, knitting, quilting, paper making, printmaking, and ceramics among other things. I just figured I might as well do it myself if I could. I purchased all my own materials and brought in my own equipment.. We had great FUN! To this day I still run into kids (now in high school) who remember me as “their” art teacher! One recently told me he was going to study art in college. And since it was volunteer work, I happily existed “outside” the system and pretty much did whatever I was interested in teaching. The teachers were happy to have a break and not have to deal with the “mess” . Most felt completely out of their element teaching art (not to mention too busy with standards and testing) and were relieved someone else wanted to do it. There was no budget for an art teacher. Only when one has some experience in making something can one appreciate and recognize its aesthetic value or significance. If we have never made things with our own hands, how can we understand or appreciate what went into creating it? Today, kids often don’t have exposure to creating things from scratch, even at home. Canning, gardening, baking, & sewing were things many of us in our 40’s and older grew up doing. How many kids these days are learning these skills? We make less and less here in this country it seems, in our homes as well as in manufactured goods. As artists/makers/crafstman, we can wring our hands and complain about the paucity of hands-on art in the schools. We can write grants and beg for money to implement some art program we’ve devised. I think in the end, it is left to the crafts makers and artists ourselves to teach these skills. We can mentor younger artists/craftspeople and teach them what we know about what we do and what life choices we make to exist as artists. We can teach at local community centers or park and recreation programs. We can share our work over the internet. I’d love to hear comments on this subject from others who make a living from their work.. I have little daily contact with other artists/makers and am really interested in hearing other viewpoints. …on another subject- commenting on blogs. I see quite a number of people (from all over the world!) visiting this site yet so few leave a comment. From my blog stats, I can see that many of you have arrived here from googling topics related to shibori, flickr photo pools related to textiles, or some contact you have had with me and my past or present work. Some of you visit on a very regular basis and I understand the desire to lurk anonymously. I do it all the time, and when I am visiting an artist’s (or any) blog regularly, I like to say hi and thanks for the info provided or ask a question or two. So don’t be shy, leave a comment, share your point of view, ask a question or just say hello while you’re passing through. Got a new camera (Nikon D40) so look for new photos soon as I learn how to use it! This entry was posted in japanese textiles, offtopic on December 21, 2006 by shiborigirl. This morning I was browsing the site of the Arimatsu Tie Dye Museum and in my head planning my next trip to Japan to visit the shibori museum there. At this point I have a number of things I want to do while I am there and I will email a few of my friends to check out some possibilities. Although I could easily spend another month there, reality suggests that a week to 10 days might be my limit. Better brush up on my Japanese! 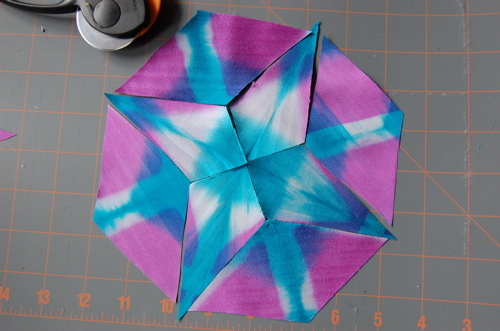 This entry was posted in offtopic, shibori on November 13, 2006 by shiborigirl. After numerous image posting/viewing problems on eblogger, I have decided to move the blog to wordpress. Until I get all past posts and images moved over, you can still view the blog here. I have also started a shibori photo pool on Flickr! in hopes of communicating with others practicing shibori. All new posts will be made to this blog only. This entry was posted in offtopic, shibori on October 6, 2006 by shiborigirl.